"Join us where Seven Rivers meet to create an amazing authentic steakhouse experience. Deep wood tones in our lounge and restaurant as well as unique lighting features, create the feel of a historic casino steakhouse combined with all the modern wonder of culinary advancements. Our Chefs will wow you from the exhibition kitchen, creating unique steak and seafood combinations. Prime cuts, local/organic vegetables and ingredients, and the knowledge and some secrets from Chefs who have traveled the world. Join us in the lounge for happy hour and then head into the main Seven Rivers dining area for an evening that is like no other in the Four Corners." Well, this snippet describes the Seven Rivers beautifully. Now, add fingerstyle guitar and a little banjo to this beautiful setting and we have all the ingredients for a top-shelf evening. I hope you can join me. In this historic mining town that whispers of Butch Cassidy and the Old West, the annual festival brings together renowned winemakers and America’s finest chefs for an intimate 4-day (June 27, 28, 29, 30) wine and food experience. Educational seminars, wine pairing dinners, reserve and grand tastings – something for everyone. I'll be adding my guitar and banjo to this festival... in BEAUTIFUL Telluride! BEAUTIFUL setting - rambling cottonwood trees, the breeze, outdoor areas, peacocks, some of the world's best fly fishing a stones through away, wonderful dinners, live music, and FANTASTIC tasting wines (the vineyard is on the grounds). Back for my 3rd year, I get to add my guitar and banjo to this beautiful setting as part of the Outdoor Music & Dinner Series. Update - The guest on April 13 will be Carl Mori. Carl is one heck of a guitar player. Carl was Jerry Jeff Walker's guitar player on a tour a few years back and he owns the Music Shoppe in town. I'm looking forward to passing leads back and forth with this fellow! Original - I have a vision of how this event could go. I'll play the first 1 hour or so for the dinner crowd (instrumental fingerstyle guitar, banjo tunes, and sing a few tunes), then, I will invite up a guest and together we will play the last hour spontaneously - no pre-planning, just look at each other and GO! I have been in these spontaneous settings and the music can be very exciting! The guest will be a local picker. Sound like fun? And, don't forget, Pagosa Brewing has a TON of award winning beers to choose from. I'll be joining the Girls again, for the 2019 Over the Rainbow event. Here is a link to the event. The Picasso and Vino folks will be there. I'll be playing from 5pm until 9pm. Best sounding room in town! (the atrium of the luxury hotel). The Ross Aragon Community Center offers a unique opportunity for local non-profit organizations to earn funds. The Festival of Trees is an auction of Christmas trees that are decorated by non-profit groups. All proceeds for the tree auction go directly to that non-profit organization. Whether you want to decorate your house for Christmas or donated to a family in need of a tree; come listen to live music by, bid on your favorite tree, sip on some wine and have some fun. Nothing in town will put you in the Christmas spirit like the gift of giving!! This years doors will open at 5:30pm with a cash bar, hors doeuvres and live music by Steve Blechschmidt. The auctioning of the trees will start at 7:00pm. Tickets to this wonderful event are ONLY SOLD IN ADVANCE and are $25.00 per ticket. You can purchase tickets at the Ross Aragon Community Center. Table reserving is also available. Guy and I are back in this beautiful setting for a private event. The Art Council of Pagosa Springs will be hosting a fundraiser to benefit the Pagosa Humane Society. An array of local artisans offering jewelry, art, apparel, home décor, baked goods, leather goods, chocolate, wildlife photography, makeup artistry, and more! Featuring festive holiday beverages and free gift-wrapping. Carol Blechschmidt and her autoharp will be joining me and my banjo. I will also play my fingerstyle guitar tunes. We are looking forward to a fun-filled day! Last minute booking... I'll be playing at The Springs tonight, 11/23. 5pm to 8pm. Carol Blechschmidt will be joining me for part of the evening - autoharp and banjo. So after the Black Friday busyness, come on by, sit in the the big cozy chairs and unwind. We will play some music for you. I believe it's time to bring out a few Christmas tunes. Back in this beautiful room. A fantastic room to hear the guitars. All be adding the instrumental guitar, banjo, and my wife, Carol, will be playing the autoharp on a few tunes as Susan (owner) showcases another fabulous artist and their work. There will be appetizers and other goodies. If you are not familiar with Belevedere, you show come and see all they have to offer, from ceramic classes to fine pieces ready for sale. I'm pretty sure that this Wednesday is the last time for playing on the deck in 2018. Playing on the deck in 2018 proved to be a huge success - positive feedback from the patrons and from Alley House management. I'm VERY thankful for being part of the Alley House Grille! Alley House Grille - thee finest dining and drinks in Pagosa Springs. They have a beautiful covered deck nestled amidst the trees where I will be playing. So... the cuisine, the libations, now add fingerstyle guitar and some old time banjo tunes, and you have all the ingredients of a beautiful evening. This is going to be special... I'll be in the VIP tent... Here are the details. Colorado Mountain Winefest presented by Alpine Bank returns to Palisade for its 27th year! Recently named the Best Wine Festival in the Nation by USA TODAY, Mountain WInefest is an event not to be missed! Join thousands of fellow wine enthusiasts from around the globe as you sip unlimited samples of Colorado wine, enjoy live music, a grape stomp and chef demonstrations, education seminars and more in picturesque Riverbend Park. General Admission, VIP, Non-Drinker and Shuttle tickets are available online. Tickets will not be available at the door. You must be 21 years of age or older to attend any Winefest event. General Admission | $50 | Includes entrance into the park, commemorative wine glass and wine tote, unlimited tastings from over 50 Colorado wineries, seminars, chef demos, live music, the grape stomp and much more! VIP Tickets | $210 | SOLD OUT | Includes a separate entrance and access to the shaded VIP Pavilion, commemorative Riedel crystal wine glass, a wine tote filled with gifts, exclusive parking in our VIP parking area, a delicious array of fresh gourmet dishes, concierge wine storage located in the Pavilion, unlimited tastings from over 50 Colorado wineries, live music, the ever-popular Grape Stomp, chef demonstrations and interactive seminars! Your VIP ticket will act as a shuttle ticket as well! Simply show it to the shuttle driver and you will gain access to the round trip shuttle from Grand Junction to Palisade on September 15th, a $15 value! Shuttle Ticket | $15 | Round-trip shuttles from Grand Junction to Palisade. These shuttles stop at several participating hotels on Horizon Drive and Downtown Grand Junction. Scheduling shift this week - I'll be at playing tonight. Looks to be beautiful weather! Back on the Balcony! I love being told to "turn it up" which often happens on the balcony. These summer evenings are special. Two Guitars Telling A Story will be playing for a wedding ceremony. I'm sure most of you know of Wines of the San Juan, but in case you don't, you need to check this place out. BEAUTIFUL setting - rambling cottonwood trees, the breeze, outdoor areas, peacocks, some of the world's best fly fishing a stones through away, wonderful dinners, live music, and FANTASTIC tasting wines (the vineyard is on the grounds). I get to add my guitar and banjo to this beautiful setting as part of the Outdoor Music & Dinner Series. I play on August 19, 2018, 4pm to 7pm. There is also the Wine & Shine Classic Car show earlier this day. Experiencing Wines of the San Juan is a must do! Guitars on the fairgrounds. I'm so looking forward to letting the guitar and banjo music roll around the grounds! I'll be playing on the main stage in the Activities Tent. 4pm start. This is a private event for some folks who have asked us to play for the last 3 years. We are honored to be part of this special event. All be adding the instrumental guitar music as Susan (owner) showcases another fabulous artist and their work. There will be appetizers and other goodies. If you are not familiar with Belvedere, you show come and see all they have to offer, from ceramic classes to fine pieces ready for sale. I'll be playing in the hotel atrium area. This is a excellent room to hear acoustic music. There are big comfy chairs and Pattie will be behind the bar. Two Guitars Telling A Story event - Folks all around sampling wine and cheese, beautiful Winter Park, our guitars filling the air, my-oh-my this is what great days are made of... Guy and I found that special space last year at this event and we are looking forward to this year's festival! I hope you can join us. Click HERE for a link to the event. Two Guitars Telling A Story event - Guy and I are back in Denver for a rare Denver show. Woods Boss Brewing is a new brewery in downtown Denver that is catching the eye of many and receiving great press for their beers. Woods Boss won the 2017 Favorite new brewery award from Colorado Beer Geeks. We are looking forward to bringing our unique music to this exciting establishment! I'll be playing my fingerstyle tunes, some banjo, and I'll add some singing of great americana songs. Come and enjoy the beauty of fingerstyle guitar on the stunning outdoor balcony! I'll be joining Ron of the San Juan Mountain Boys. I'll be playing guitar and banjo. Last minute booking... I'll be playing today (May 30), 5pm start. I'm looking forward to being part of La T.! Steve Potter and his team are working hard at building a premier music venue in Pagosa. And, my choice from the wonderful food menu is the steak bowl with one of the specials sauces and a Riff Raff draft. Hope to see you there! Pagosa Mayor, Don Volger, is leading a group of folks to take part in the Beautification of Pagosa. This Saturday, 5/12/18, is the kickoff event - barbecue starting at 12 noon at the Geothermal Domes (right along the San Juan River) then off to keep Pagosa beautiful! I'll be playing during the kickoff event. Come on by if you want to hear some guitar and banjo by the river. And, perhaps you will want to jump in and help keep Pagosa beautiful! Acoustic Picnic, a trio (Carol Blechschmidt, Dave Pettis, Steve Blechschmidt) will be joining the events at Earth Day this year. Visit the Southwest Organization of Sustainability website to see all the wonderful activities. I'll be playing my fingerstyle tunes, some banjo, and I ll add some singing of great americana songs. Then, that evening, Chain Station plays at the Balcony Bar & Grill Backstage. I been following these boys for years and they have been tearing it up lately! I'm looking forward to hearing Chain Station at the Backstage. A great day of music. Come and enjoy the beauty of fingerstyle guitar on the stunning outdoor balcony, then stay and let Chain Station blow you away! It's time to start grabbing these intermittent warm days and sit outside on the balcony! The Balcony Bar & Grill has a beautiful outside area (the balcony) overlooking downtown main street - a great spot to drink some local brews, soak up the sun, and enjoy Durango! Many folks are becoming involved with Belvedere Arts Studio & Gallery as they participate in the Arts. Here is a link to this event. Go banjo! It is great fun to sit in with the San Juan Mountain Boys and get after that banjo. I'll be playing fingerstyle guitar tunes and old-time banjo tunes, and, I'll sing a few songs as well. 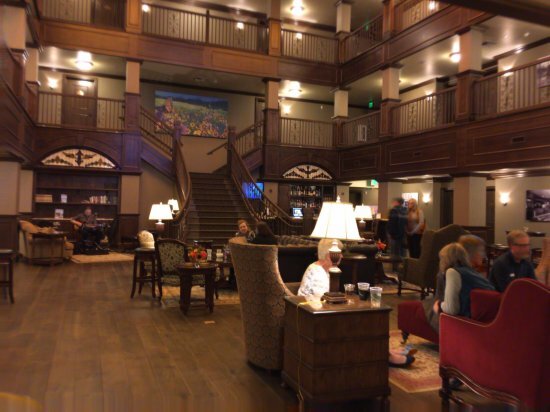 The luxury atrium of the Springs hotel is a wonderful and peaceful room to hear music - the best acoustics in town! Carol (my wife) and I will be playing Christmas songs. Carol plays the autoharp and I'll be playing banjo - a different and nice way to accompany your favorite Christmas tunes. I'll also play fingerstyle instrumental guitar arrangements of a few Christmas classics. I'm honored to join this event again this year. The Ross Aragon Community Center offers a unique opportunity for local non-profit organizations to earn funds. Festival of Trees is an auction of Christmas trees that are decorated by individual non-profits. All proceeds from the tree auction go directly to that non-profit organization. Whether you want to decorate your house for Christmas, donate to a family in need of a tree, or give money to a great cause; come listen to music, bid on your favorite tree, sip some wine and have some fun. Nothing in town will put you in the Christmas spirit like the gift of giving This year doors will open at 5:30pm with a cash bar, hors doeuvres, and live music by Steve Blechschmidt. The auctioning of the trees will start at 7:00 p.m. Tickets to this wonderful event are only sold in advance and are $25.00 each. Table reserving is also available. Breast Cancer Awareness Reception. Learn about the importance of early detection with doctors from the Pagosa Medical Center. I will be providing Cocktail and Dinner music. Here are the event details... This popular ladies night out will be held on Saturday, October 14th, 5:30 at the Ross Aragón Community Center. Our theme is “Prom Night” so dust off those retro prom dresses, gather your girlfriends and join us for the fun. We will feature silent auction masterpieces created and donated by members of our fantastic community as well a delectable dinner by Alley House Grille and high energy dancing to the music of the Cannon Dolls. This all-girl band from Durango can’t wait to rock a house of all ladies! There will be surprises during the evening to keep you entertained and opportunities to make a difference in the life of a child. Tickets will be available for sale beginning Monday, July 31st. New this year, all seating will be reserved and tickets will be $55. Tables for eight can be reserved for $440. To purchase tickets call 264-5513, stop by Seeds at 575 S. 7th St. or visit our Facebook page. Each year this event sells out so buy your tickets early to avoid being disappointed. After all, we would hate for you to be stood up on Prom Night! Me, the guitar and the banjo take our first trip to Taos. Looking forward to being part of the Tap Room! Come and join all the critters for Yappy Hour. There will be food provided and I will be adding the music. It's Sunday... It's Riff Raff... slow down... breathe... exceptional craft beer... flavorsome meals... good folks all around... now add instrumental fingerstyle guitar and banjo. Yes it is this nice and this fun. I start playing at 4pm. Two Old Crows Gallery is an exciting art gallery on Lewis Street in historic downtown Pagosa Springs, Colorado. We are pleased to present a variety of compelling pieces from both regional and national artists. The festival is outside. There will be booths showcasing artist's work. Steve will be playing throughout the day. Come and support art in the Pagosa community at the 1st Annual Art Festival! Two Guitars Telling A Story will be playing for this event - wine, art, cheese... and our guitars! Two Guitars Telling A Story will be playing. This is a private event. Gratitude Gala - thanking the donors that help make it happen! Steve will be joining the Mountain Home Makers Club for a special event. I'm looking forward to letting the guitar music roll across this beautiful setting! Border Rio hosts Wild Wino Whiskey Wednesday - $2 off a glass of Wine or any Whiskey drink 3pm to close, nice! Wine/whiskey and instrumental guitar pair beautifully! Carl plans to stop by at 5:30-ish - oh no! Borde Rio has a wonderful selection of drinks and excellent food, not to mention great folks all around! And, Borde has two big fireplaces, perfect to warm you up after skiing. Border Rio hosts Wild Wino Whiskey Wednesday - $2 off a glass of Wine or any Whiskey drink 3pm to close, nice! Wine/whiskey and instrumental guitar pair beautifully! I'll be playing during dinner 5:15 to 6:15. The Girls Choir sings from 6:30 to 7:00, then the San Juan Mountain Boys play from 7pm to 10m. Come on by and join the Wolfe folks as the instrumental guitar and banjo rolls through the room. Good times and great people at Wolfe Brewing! Come on by and join the wonderful Wolfe folks as the instrumental guitar and banjo rolls through the room. Steve brings his instrumental guitar and banjo music back to the Pinery. I'm not sure if you have to be a club member to join this event - you can call the Pinery and ask if needed. Come on by and join the Wolfe folks as the instrumental guitar and banjo rolls through the room. The Mahogany Grille, located inside the beautiful and historic Strater Hotel, "...is your place to enjoy handcrafted cuisine while stepping back in time. We offer the ambiance of the Victorian Old West as we serve you an array of eclectic culinary specialties. It’s the blending of the simple with the ornate—of the old with the new." Start your Saturday with unique and top shelf instrumental guitar and banjo music coupled with a thee best brunch in southwest Colorado. I'll be playing every Saturday... God willing and the creek don't rise... Well, wouldn't you know, the creek did rise. My last Saturday at the Strater was 12/24/16. Come join use a celebrate the season! Steve will be playing instrumental guitar versions of a few Christmas classics. Carol, Steve's wife, will join Steve and together they will play Christmas favorites on the autoharp, banjo and guitar. I'b be adding a few Christmas songs to my normal fingerstyle guitar and banjo set. I look forward to joining the Wolfe folks and the skiers at this time of year. Merry Christmas! Business After Hours events are a great way to build relationships in the Pagosa business community (FYI, I'm a member). This event will be in the luxury hotel atrium area - lots of big comfy chairs, a bar, and the best acoustics in town for listening to music. The last time I played at Wolfe Brewing folks were having a great time and the place was very full. I start at 5pm. I hope you can find a seat. Carl Mori might sit in again for a little while - two guitars getting after it, pretty cool. The best room in Pagosa for hearing and relaxing to acoustic instruments. I'll be adding a few Christmas songs to my set played in the classical guitar style. Sit back in the big comfy chairs, drink some wine, and sloooooooow down during the Holidays. Come join me at Wolfe Brewing. I'll play a dinner set of music early (5pm start), then I'll pick it up a notch as we roll into the evening. The guitar and banjo are pretty stoked. The Wolfe folks know how to have a good time! My first time at Riff Raff. I'm pretty stoked. The guitars and banjo are looking forward to this. The folks at Riff Raff are mighty fine, this should be great fun! Wine goes very well with instrumental acoustic guitar! I'm told there are discounts on wine, it's Wine-Down Wednesday after all. Two Guitars Telling A Story is off to beautiful Grand Lake, CO. The Phoenix Room is an excellent room to listen to music. Big lounge chairs and sofas, spread throughout a relaxing room/atmosphere, complete with a nice bar. Archuleta School District appreciation night. Drink specials and appetizers in the Phoenix Bar of the atrium in the luxury building. The strings help the stress disappear. I'll be playing in the Phoenix Room. Steve and Guy are back at Cheyenne Mountain Resort! We will playing for the Meta Bodywork open house. Come and join us! I think you have to be a member to join this event. The riverside deck should be ready to go. Great people. The river. Overwhelming beauty. The food, the wine, the beer. Pagosa. I'm looking forward to joining you all. Steve will be playing with the duo, Two Guitars Telling A Story, for a special celebration. Beautiful setting, good people, great food and drinks. Come and let the strings remove the stress. Steve will be playing with the duo, Two Guitars Telling A Story, at this beautiful setting. Compliment your soak with soothing instrumental guitar, banjo and a glass of wine (or 3). The strings help the stress disappear. I'll be playing in the Phoenix Room. Compliment your soak with soothing instrumental guitar, banjo and a glass of wine (or 3). I'll be playing in the Phoenix Room. Price: Open to public, come on by! You must be a member to see this event. Not sure if you have to be a member of the club to see this event. Give them a call if needed - 303.841.2060. Thank you!